Tata seems to have covered all the bases with the upcoming Nexon. But, how does the new compact-SUV stack up against its established rivals on paper? Tata’s next big launch, the Nexon compact-SUV, is just around the corner. We’ve already driven the sub-4m SUV and Tata Motors seems to have covered all the bases with its forthcoming offering. The thing is, though, the sub-4m SUV segment is not an easy nut to crack and it already has a lot of capable products, such as the Maruti Suzuki Vitara Brezza, Ford EcoSport and the Honda WR-V - okay, the Honda may not qualify as a real compact-SUV, but it’s been eating into the sales of the Maruti and Ford ever since its launch. So, has the Tata Nexon got the measure of its rivals? Well, let’s do a quick spec-check of the Nexon with other best-selling cars in its segment to find out. In terms of dimensions, all the cars are evenly matched, albeit there are a few areas where one or the other edge the rest. Length wise, all the models measure just below the 4m mark. 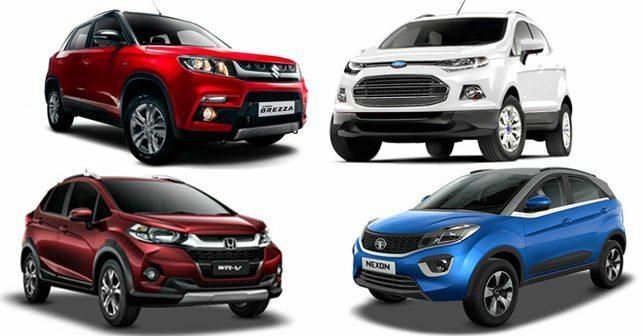 However, the Nexon is the widest while the EcoSport is the tallest. The WR-V has the longest wheelbase and as we noticed during our road-test earlier, the WR-V’s cabin is quite spacious owing to that. Not only that, the WR-V also has the biggest boot of the quartet. However, thanks to its hatchback underpinnings, the WR-V has the lowest ground clearance of 188mm. The Vitara Brezza and EcoSport are neck and neck at 198mm and 200mm, respectively. But, it’s the Nexon that has the segment best ground clearance of 209mm. Apart from the Brezza – which is only available with a diesel engine - all the other cars listed here come with both petrol and diesel engine options. The Nexon’s powertrains look quite impressive on the paper – its petrol engine is a 1.2-litre turbocharged unit that develops 108bhp and 170Nm of torque. The diesel engine is a new 1.5-litre turbo engine that also develops 108bhp and 260Nm of torque, making it the most powerful engine of this bunch. A six-speed manual is standard, while Tata is expected to bring in an AMT-equipped version in the near future. The WR-V gets a 99bhp/200Nm 1.5-litre diesel and 89bhp/110Nm 1.2-litre petrol. The former is paired to a six-speed manual while the latter gets a five-speed manual. There’s no automatic on offer as yet. The Brezza, on the other hand, is only available with a 1.3-litre Multijet diesel engine that is rated at 88bhp and 200Nm and comes exclusively with a five-speed gearbox. Now the Brezza may sound the most underpowered car here, but since it is lighter, it's quite a peppy machine to drive. The EcoSport, however, trumps others here when it comes to providing engine or gearbox options – it has three engines (two petrol) and a diesel on offer. The petrol range starts with a 1.5-litre engine that produces 110bhp and 140Nm of torque. It is available with either a five-speed manual or a six-speed dual-clutch automatic gearbox. In case you want more performance and tech, there’s the award winning 1.0-EcoBoost turbo petrol with a five-speed manual – the engine is rated at 123bhp and has 170Nm of torque on offer. The 1.5-litre diesel mill of the EcoSport is also quite exciting to drive with 99bhp and 205Nm on tap. The diesel is available only with a five-speed manual. Tata will offer dual airbags and ABS with EBD as standard with the Nexon. The WR-V also has ABS and dual-airbags as standard. Ford doesn’t offer ABS as standard but dual airbags are – in fact, the top-of-the-line variant of the EcoSport gets six airbags, which none of the others offers. The Brezza only has driver airbag as standard, although ABS and passenger airbag are optional in base models.